Let our experienced contractors create a beautiful, long-lasting, waterproof design for your Connecticut basement. Transform your unfinished or previously finished basement into a comfortable living space with the award-winning Total Basement Finishing™ (TBF) basement remodeling system, installed by Connecticut Basement Systems. 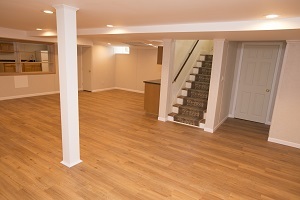 We offer complete basement finishing services in Stamford, Norwalk, West Hartford, New Rochelle, and nearby. Call 1-855-200-7133 to discuss your basement remodeling plan with our specialists or click below to request your free design estimate! The versatility of our basement finishing system allows for you to do virtually anything you want with your basement. Add an extra bedroom and living space, or mount a TV on our studless basement walls to create an entertainment room! The basement design ideas are endless and Connecticut Basement Systems can help you find the best solution for your home. Total Basement Finishing in Chappaqua, NY! If you're interested in planning and pricing for your remodeling project, Connecticut Basement Systems can help. We would like to offer you a free basement design quote at no obligation. At Connecticut Basement Systems, our mission is to provide you with responsible basement finishing, at a fair price, while providing exceptional customer service. We proudly serve Stamford, Norwalk, West Hartford, New Rochelle, Greenwich, Glastonbury, Eastchester, Carmel, Milford and many surrounding areas in CT and Westchester County, NY.